Splicer, heat gun, glue guns, glue sticks, styrene suppressant additives, knee pads, spiked shoes, trigger fed gun, lever fed gun, styrid styrene. Lightweight nozzle device tangles roving together, creating a splice without making a knot. Allows roving to feed easily through most of your equipment designed for continuous operation. 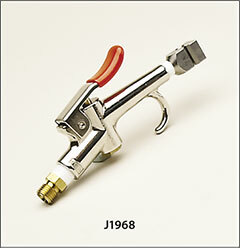 Operator holds device in hand, keeping fingers beneath the curved hook with thumb on air trigger. Then move splicer along about 6" of glass strand. Splicing takes only a moment. Customer reports that the J1968A splicer works great on 113 rovings. To determine linear density of roving, TEX is weight in grams per kilometer (km) of yarn, fiber, filament, or strands. Yield is weight per unit length in yards per pound. For example, a 113 yield product weighs 113 yards/lb. Or expressed in metric units, a 113 product weighs 4,390 grams/km. To convert yards/lb into TEX, TEX = 496052 divided by yards/lb. I.e. 496052 divided by 113 = 4389.84 TEX. To convert TEX into yards/lb, yards/lb = 496052 divided by TEX. I.e. 496052 divided by 4389.84 =113 yards/lb. 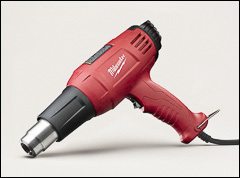 Dual temperature heat gun used for softening and molding plastics, curing epoxy, softening adhesives, drying or thawing frozen pipes, heating liquids, applying heat shrinking products, and stripping paint. 3-way power switch: high, low, off. 6' power cord with 3-wire grounded plug. 22 ounce with cord. Dual temperature: 1200°F and 790°F. 1,000/400 watt. UL and cUL listed. WARNING: Proposition 65 Label for K1050 . 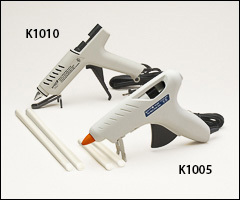 Trigger fed or lever fed glue guns. Automatic ball-check valve for complete control of adhesive flow. Used for permanently bonding all porous materials in just 60 seconds. Caution: the nozzle area temperature reaches 380°F. Read and follow all safety and operating procedures on product packaging. WARNING: Proposition 65 Label for K1005 . All purpose glue, 7/16" diameter, two different lengths. Sold by the case. Styrid styrene suppressant is specially formulated to be added into the resin to block the escape of volatile styrene and reduce emissions. 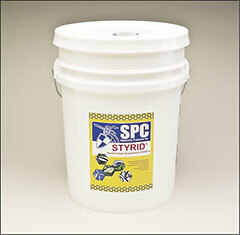 Styrid not only meets government standards for styrene control, but it's also economical and easy to use. No melting or pre-diluting is necessary. An effective additive with a unique chemical formulation. Ready-to-use formulation that mixes easily into your resin and can be used at room temperature. Tests prove that Styrid, when added into polyester resins at concentrations between 0.6% and 1.0% by weight of resin, will provide styrene suppression rates in excess of 50% with no effect on interlaminar bonding or gel time. Styrid is the answer to industry’s need to lower styrene emissions to comply with OSHA, worker exposure regulations, and EPA air emission standards. Lower price available for 40 or more of J1099. Adjustable lightweight aluminum shoes with 12 steel spikes, 1" long. Sole plate and heel support are adjustable. Two nylon straps adjust to hold shoe to boot.